The success of the prosthetic rehabilitation in a long-span fixed partial denture (FPD) requires adequate restoration of its function, periodontal health, and esthetics. 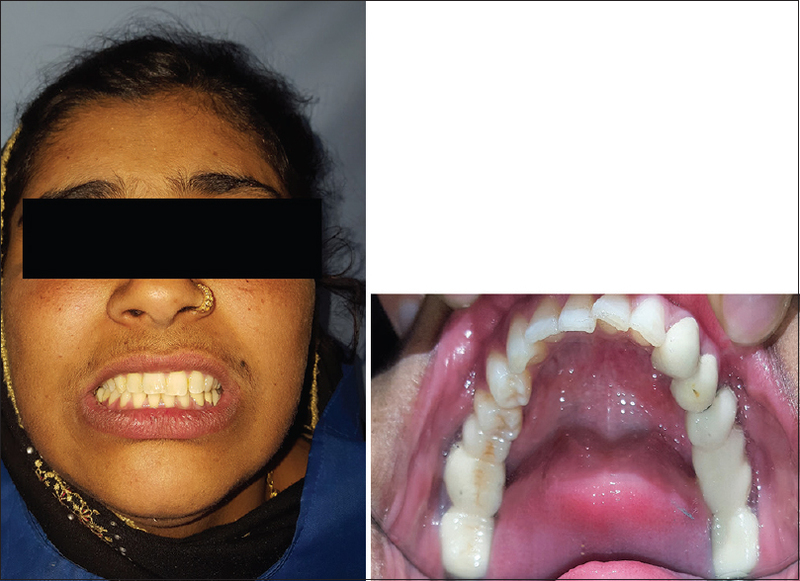 This case report describes various treatment options to overcome stresses produced in a long-span FPD with tilted molar. In such cases, tooth preparation alone cannot solve the problem; suitable alternative treatment is required such as three-quarter crowns, orthodontic uprighting, locked attachment, and use of telescopic retainers., This case report presents a clinical situation where decreased interocclusal space, short clinical crown height, and excessive tilt of the abutment did not permit the use of conventional aforementioned treatment options. Thereby, a long-span five-unit FPD was used to restore 2nd premolar and 1st molar of the third quadrant with appropriate mechanical solutions so as to break the stress around the abutments and dissipate the forces equally. A 32-year-old female reported to the Department of Prosthodontics in our college with the chief complaint of difficulty in eating. Intraoral examination showed missing 35, 36 and mesially tilted 37. On radiographic examination, all abutments showed good bone support, favorable root morphology. Palpation and percussion of teeth did not reveal any significant pulpal and periapical pathology. Further oral examination revealed mutually protected occlusion. 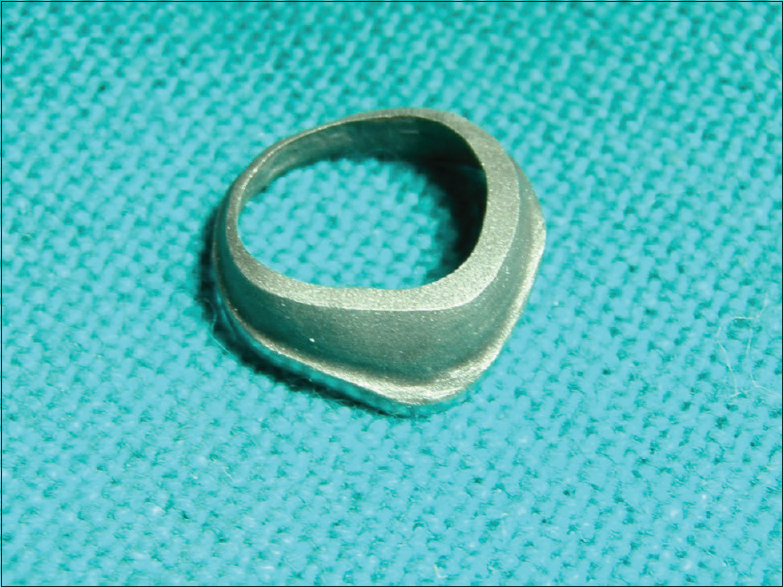 After thorough clinical and radiographical examination, five-unit porcelain fused to metal FPD with a special customized telescopic crown on 37 was planned. In addition, to overcome the undue stresses due to nonparallel abutments in a long-span FPD, it was planned to provide with nonrigid connectors. Metallic primary banding was planned in place of metallic coping on the tilted third molar abutment due to reduced interocclusal space. This was followed by the placement of telescopic superstructure. Telescopic crowns act as a double-crown prosthodontic system which will allow cross-stenting of the dental arch. Moreover, tooth preservation and stabilization can be carried out over a long time. The patient was given postinsertion oral hygiene maintenance instructions. Tilted abutments are angulated teeth in mesial, distal, buccal, or lingual direction depending on the cause and location of the same in the arch. As they are out of ideal centric contact and deviated from normal long axis, such teeth cause food impaction, dental caries, periodontal and occlusal problems creating unstable occlusion, and improper maintenance of oral hygiene. Depending on the severity of the tilt, different treatment modalities such as simple recontouring, three-quarter crowns, orthodontic uprighting, telescopic crowns, and nonrigid connectors can be considered to get the common path of insertion and reduce the amount of stress in tilted abutments.,,, In the present case report, the patient presented with a tilted abutment that was rehabilitated by providing a telescoping crown; moreover, the stress produced in the long-span bridge was reduced using a nonrigid connector. In addition to this, nonrigid connectors provided in the present case long-span FPD, transmitted shear stresses to supporting bone rather than concentrating them in connectors, thereby, minimizing mesiodistal torquing of the abutments and allowing them to move independently.,, The “double-crown concept” of the telescopic prosthesis and the intrinsic design of nonrigid connector allowed proper dissipation of the masticatory forces. Therefore, accurate planning of the design philosophy is critical in success of the long-span FPDs with tilted abutments. Shillingburg HT, Hobo S, Whitsett LD, Jacobi R, Brackett SE. Fundamentals of Fixed Prosthodontics. 3rd ed. Chicago: Quintessence; 1997. p. 85-103. Rosensteil SF, Land MF, Fujimoto J. Contemporary Fixed Prosthodontics. 3rd ed. St. Louis: Mosby; 2001. p. 673-96. Sorensen JA, Martinoff JT. Endodontically treated teeth as abutments. J Prosthet Dent 1985;53:631-6. Goodacre CJ, Spolnik KJ. The prosthodontic management of endodontically treated teeth: A literature review. Part I. Success and failure data, treatment concepts. J Prosthodont 1994;3:243-50. Picton DC. Tilting movements of teeth during biting. Arch Oral Biol 1962;7:151-9. Lundgren D, Kurol J, Thorstensson B, Hugoson A. Periodontal conditions around tipped and upright molars in adults. An intra-individual retrospective study. Eur J Orthod 1992;14:449-55. Langer A. Telescope retainers for removable partial dentures. J Prosthet Dent 1981;45:37-43. Langer Y, Langer A. Tooth-supported telescopic prostheses in compromised dentitions: A clinical report. J Prosthet Dent 2000;84:129-32. Weaver JD. Telescopic copings in restorative dentistry. J Prosthet Dent 1989;61:429-33. 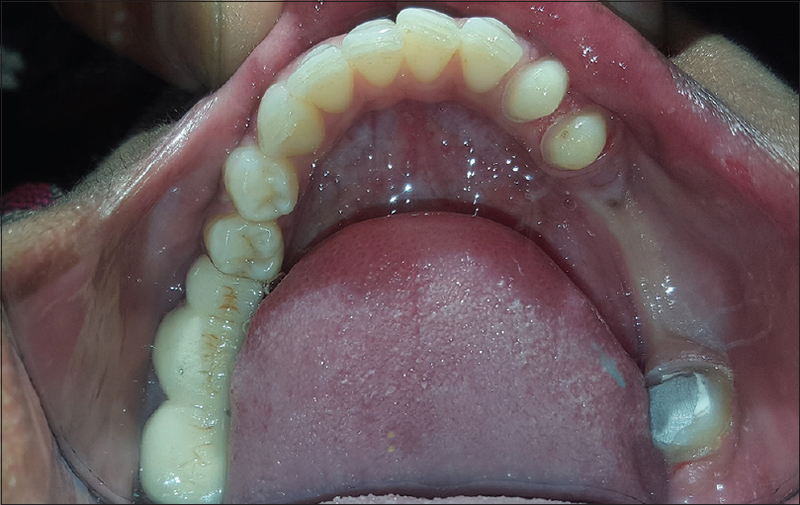 Yadav K, Rathee M. Management of tilted molar abutment by telescopic crown: A case report. Indian J Appl Res 2014;4:490-1. Kumar P, Singh V, Goel R, Singh HP. 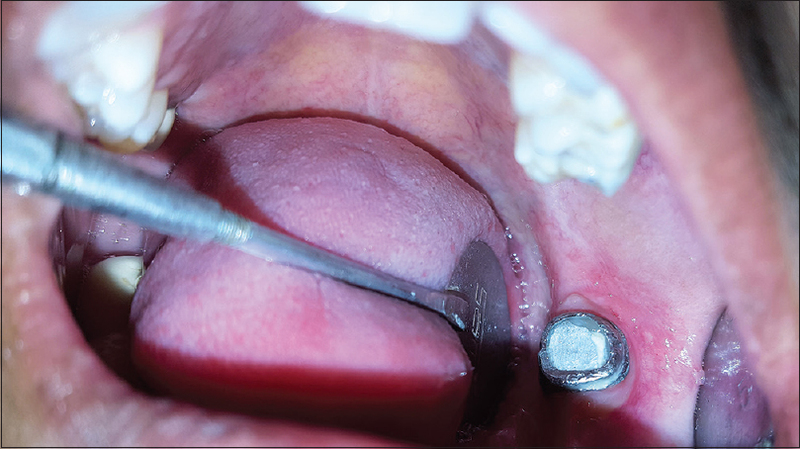 Non-Rigid connector in fixed partial dentures with pier abutment: An enigma simplified. Int J Health Allied Sci 2012;1:190-3. Mattoo K, Brar A, Goswami R. Elucidating the problem of pier abutment through the use of a fixed movable prosthesis-A clinical case report. Int J Dent Sci Res 2014;2:154-7. Pandey P, Mantri SS, Deogade S, Gupta P, Gala A. Two part FPD: Breaking stress around pier abutment. IOSR J Dent Med Sci 2015;14:68-71.